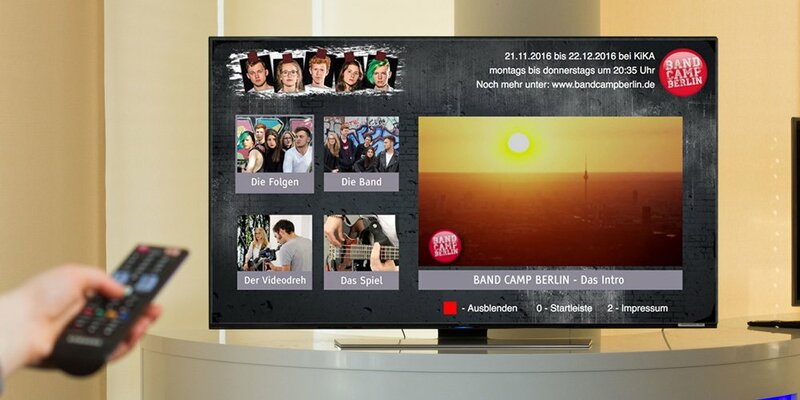 Berlin's regional broadcaster rbb launched "Band Camp Berlin" series. It will be shown on German TV channel KIKA with additional HbbTV based material. Fraunhofer FOKUS provides the technical basis and developes an editor toolkit for the HbbTV App within the project MPAT. As a worldwide first, the series offers the opportunity to watch 360°video on common HbbTV devices. Fraunhofer FOKUS developes the technical basis for creating supplementary HbbTV material for the rbb production "Band Camp Berlin". The TV series of 20 episodes is being broadcast from November 21 to December 22, 2016, at KIKA channel. It is a documentary about five 17-year old teenagers, who form a rock band. The camera accompanies them until the young musicians reach their goal to perform at a popular music fair in Shanghai. The MPAT project, coordinated by Fraunhofer FOKUS, developed the editor toolkit for the TV supplementary material – including photos, videos, background information, soundbites, a karaoke-like audio presentation and 360° content. The toolkit uses, like HAT, a WordPress based user interface and enables content creators like the rbb to produce HbbTV applications easily and cost effectively. The supplementary material features a 360° behind the scenes video. The 360° video content is streamed from the Fraunhofer FOKUS 360° Video Cloud Streaming Server, allowing 360° on regular SmartTVs without inbuilt 360° functionality. This technology renders only the selected view and therefore reduces the bandwith needed. With Band Camp Berlin consumers have the first opportunity to watch 360° video on their domestic HbbTV device.